Each person needs to discover his or her own gift in himself – this is what Irina Malikova from the Russian town of Orenburg thinks. Embroidery collars of Irina Nikolayevna Malikova are beyond the scope of crafts and as unique as creative activity any persisting artist. 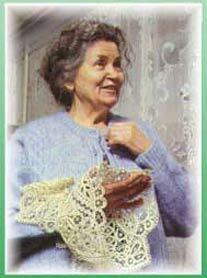 Irina Nikolayevna has always been sewing and embroidering. She has seen the ornaments in her dreams at night, she was attracted to the embroidery. She had been moving with her husband – a serviceman – from the south to the north and her mother's gift - a sewing-machine had been traveling with her. Irina Nikolayevna is wearing a neat black dress with the white stitched collar, she has a calm low voice. And it's somehow hard to believe that all this triumph of paints, the wildness of colors of the summer meadow, the frosty ornaments and the tender spring beauty is created by the gift, imagination and skill of only one woman. – Irina Nikolayevna, tell us about your childhood.  My parents lived in such a poverty, which is hard to imagine. I was born in Kazakhstan, but I have spent all my childhood in Uzbekistan. We, - the children of the war-, have been working unsparingly at the cotton fields, because we knew that they make gun – powder of the cotton seed, and they make threads out of the white fluffy balls. Everything for the front, anything for the victory. I have always tried to over – fulfill the rate: the best cotton collector was given a prize – ten copybooks. I will never forget how happy was my family, when the spring was coming and our garden was in blossom. I can still smell the scent of the blossoming trees: peaches, apple-trees, cherry-, andn pear-trees.  How did your further life turn out?  We, with my sister, got married to the servicemen and separated to the different places. She stayed to live in Latvia, and I have settled down in Orenburg after the long removals. I have been working here as a needle – woman in the experimental shop of the Orenburg's Family Life Center, I have also been teaching a study group of the machine embroidery. Once I have counted that I had taught and graduated 400 students. 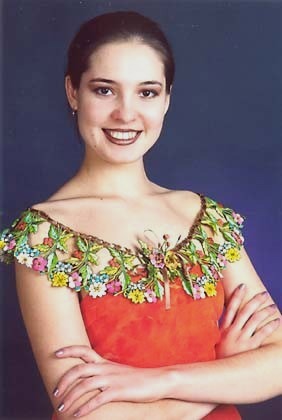 I embroidered blouses, dresses, and elegant suits. The Orenburg Museum got interested by my works. It bought my collection. When I had given my collection to the Museum, came back and opened the wardrobe, I saw the empty place and started to cry. Then I sat at the sewing – machine again. I haven't been communicating with anybody for 5 years, I've been working day and night, dreaming about giving the beauty to the people again. I felt an unusual joy, when I had created the new collection of the embroidered collars.  Which materials do you use?  I prefer working with chiffon, it's light and somehow air. Translucent fabrics, mainly green tone, severs gentile natural background for garden flowers and wild flowers, embroidery artistic smooth surface: forget-me-not, iris, stylized poppy, apple brossom, wild rose, violets. Besides cutting out the future lace, I need to score its edges by the soldering iron, to remove fiber and threads. 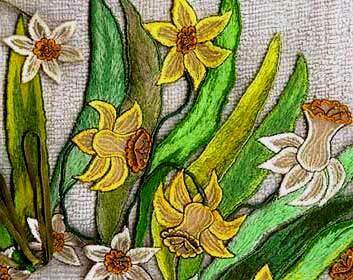 I came to a conclusion that the best threads for embroidery – are Chinese muline threads. These threads don't fade, they don't lose their color, and they lie down on the fiber very easily. My working tool – is an old Podol sewing – machine. I have been working with it for 25 years already. I compare my work to the work of musicians. Every day, just like a pianist, I need to practice. If I miss one day, hands won't listen to me.  What is the secret of your proficiency?  The combination of the cotton thread and synthetic background fiber enables to make the perfect cut satin-stitch: the edges of the opening from the back are soldered by the soldering iron, which forms a straight even border. If you use synthetic thread for embroidery, then each flower is stitched additionally along the contour by the brown cotton thread, which prevents the ornament from melting and at the same time serves as an additional mean of expression, it makes the shadows deeper and forms a clear-cut graphic contour.  Have you managed to exhibit your works often?  My works were exhibited in Orenburg, Chelyabinsk, Vyatka, Kirov, Latvia, Moscow and other places. Foreign representatives from France, USA and Japan were also present at the Moscow exhibition of the light industry. Among the other works my collars were also on the stand. There were many people, willing to buy them, but I couldn't part with them.  Do you have a dream, Irina Nikolayevna?  I do, just like any other person. I wish God send me a few more years to live. I didn't manage to accomplish all of my plans. I wish I had more like – minded people. Maybe some of the women will discover my craft for themselves. I truly believe that the beauty will save out world. 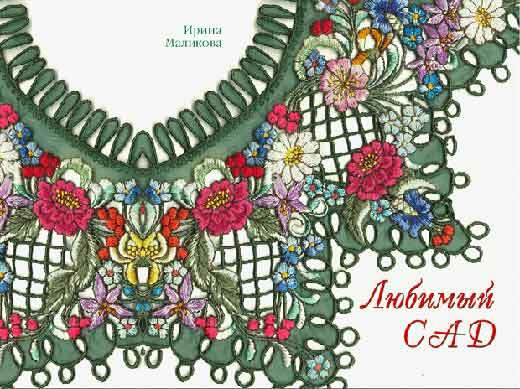 Come to see the website of Irina Malikova: "Embroidery of Irina Malikova - www.vorotniki.narod.ru"